Paris in mind, a photo by webmink on Flickr. To carry on the hilltop theme today, here’s a reflected view of a sublimely beautiful building. 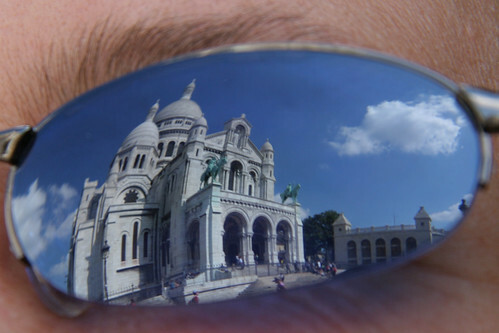 The fact the sunglasses are blue helps the sky look bright, but it was a gorgeous day at the top of the steps leading to the Sacre Coeur at Montmartre in Paris. This photo is also by way of introduction to my new co-author Minkette, whose eyebrow can be seen above!